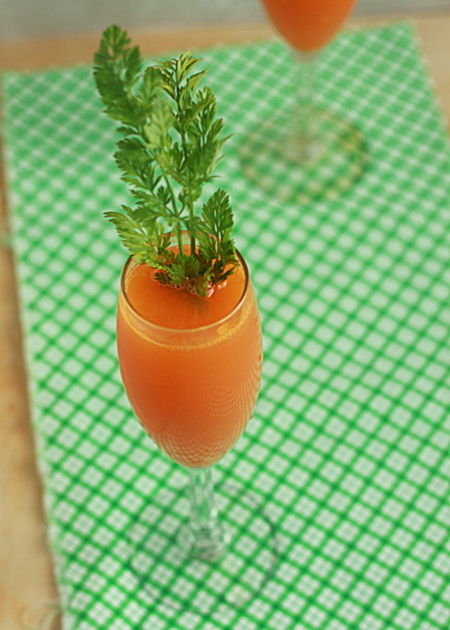 Carrot juice and Prosecco combine to make these cute, kitschy mimosas that couldn't be more perfect for Easter. Okay, I’ll admit it up front: this is sort of a strange one. I totally know that. But Easter is coming up on Sunday, and I had to. I had to. 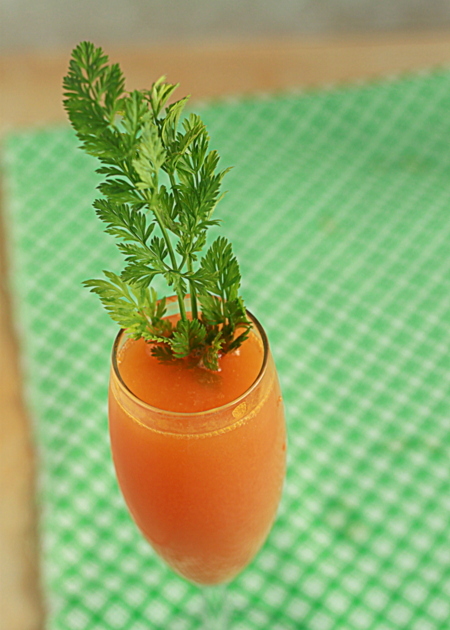 I’ve been thinking about making carrot mimosas for what seems like an eternity. 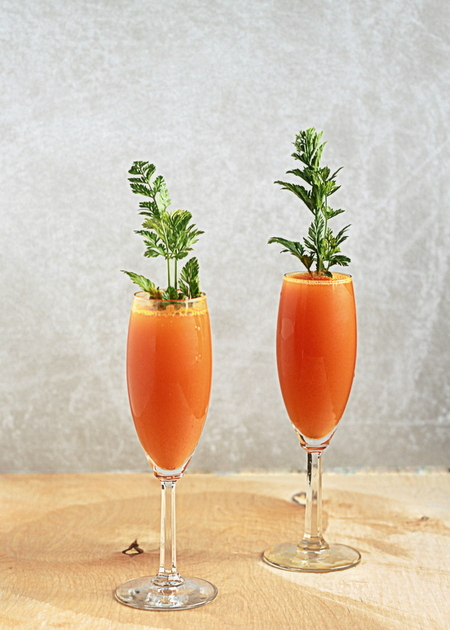 Carrot juice is naturally delicious and sweet, and it’s amazing with orange – so why not take one more step and sneak it into a mimosa somehow? I guess I ended up doing a lot more than sneaking. This is straight-up carrot and champagne (okay, sparkling wine as it’s not from France, yada yada). I actually tried a couple fancier variations including one with ginger simple syrup and another with orange juice included. You know what, though? Those really didn’t work as well as just plain ol’ carrot juice and sparkling wine. All the better for Easter. Especially when you plop a few perky carrot stems on top. 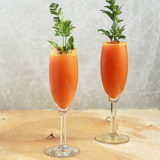 I love how this bright orange brunch cocktail, when poured into a champagne glass, takes on the shape of a carrot. I get practically giddy over stuff like that, what can I say. Imagine a tray of these with a few bunnies and eggs scattered about. Whatever, kids, go find some eggs. We’ll just be over here sipping on our carrots. Yes, it’s a little gimmicky, but these are actually pretty tasty. They’re not quite as sweet as your typical mimosa, so be prepared for that, but they’re nearly as addicting. To get the carrot stems to stand upright in the glass (parsley sprigs will work in a pinch, too), snip a plastic straw to about two inches in length, slip two or three stems inside, and set in the champagne glass. 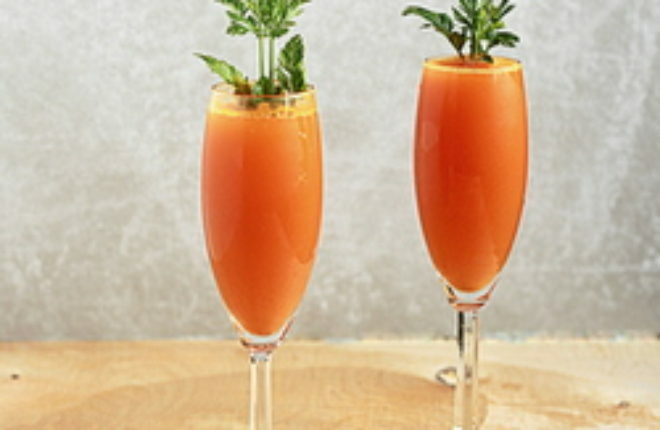 Add carrot juice and Prosecco to a champagne glass. Garnish with carrot stems or parsley sprigs and serve immediately. I recommend starting with a ratio of a little less carrot juice to Prosecco. Then give it a taste and if you'd like a little more carrot, go for it. I will admit, when I saw this in my inbox, I was like, “Carrot Mimosas?! I don’t know about that…” But you sold me. 🙂 And they really do look like carrots! I generally don’t go for mimosas just b/c they’re too sweet for me. This sounds like a great and healthy switch up. I love how you stuck in the carrot tops – how cute! I love everything about these mimosas. Brilliant!!! Pingback: 4 Creative Spring Cocktails With a Secret Ingredient : Be Live…..